Review Air Canada baggage allowances and charges before travelling. If you are moving abroad, or going abroad to study, you will need to bring a lot of your belongings with you. You will quickly find that Air Canada's baggage allowance is simply too restrictive. Plus, it would be a struggle for you to pull all that luggage behind you. This is why shipping your luggage with Send My Bag is the perfect solution. Many people also use the service when going on holiday/ vacation so they can enjoy a luggage-free journey. Get your free quote now and find out how cost-effective it is to send your luggage. One cabin bag that weighs no more than 10 kg (22 lbs) and that has dimensions of no more than 23 x 40 x 55 cm (9 x 15.5 x 21.5 inches), plus one personal item with maximum dimensions of 16 x 33 x 43 cm (6 x 13 x 17 inches). Passengers are permitted to also carry additional items, such as a diaper bag, pushchair or small purse measuring no more than 25 x 30 x 14 cm (10 x 12 x 5.5 inches). Passengers travelling with an infant not occupying their own seat may carry one additional standard cabin bag for the child’s belongings. If travelling with an infant under two years of age on your lap, you are permitted to bring an additional standard item of hand luggage on board to carry the infant's belongings. You can bring a musical instrument on board as part of your standard carry-on allowance, provided it fits within the allowed dimensions and it fits into the overhead locker or under the seat in front. If your instrument is too large, you can purchase a seat for it. If you wish to purchase a seat for your instrument, you will receive a 50% discount on any published fare. Such instruments must not exceed 162.5 cm (64 in) in length or 36 kg (80 lbs) in weight. Air Canada allows cats and small dogs to travel in the cabin, providing they are transported in a carrier with dimensions no greater than 23 x 40 x 55 cm (9 x 15.5 x 21.5 inches) for a hard-sided carrier, or 27 x 40 x 55 cm (10.5 x 15.5 x 21.5 inches) for a soft-sided carrier. The weight of the pet and carrier combined must not exceed 10 kg (22 lbs). The fee for carrying a pet on board is $50, one way, within Canada and the US (except Hawaii), and $100, one way, for international routes on which pets are allowed in the cabin. 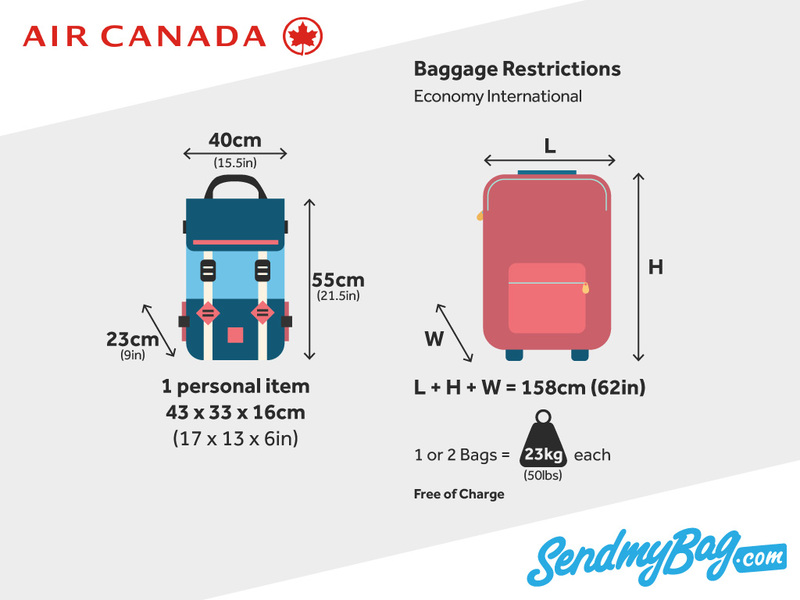 The maximum weight per bag is 23 kg (50 lbs) and the total allowable dimensions are 158 cm (62 in). The Air Canada checked baggage allowance depends on the fare you have purchased and the route you are travelling on. NB Only one excess baggage fee will apply at one time. Exceptional items, like musical instruments and sports equipment, are normally accepted as one item of checked baggage. Handling charges apply to some items, however. Bicycles, for example, incur a handling charge of $50, one way. Sports equipment should be booked with the airline at least 24 hours before you travel. Pets can travel in the hold, provided the combined weight of the pet and its carrier does not exceed 45 kg (100 lbs) and 292 cm (115 inches) in total dimensions. Fees start at $105, one way. Looking for Air Canada sized hand luggage?